I suppose every generation has its share of “Where were you when…. ?” moments – those “somethings” that happen that are so big, so life-altering, and which affect so many people that the vast majority of them have a memory etched into their mind of where they were when they heard the news, how they felt when they heard the news, and how it changed their life forever. I can still remember that morning – it started off like any other morning. Rachel had gotten up early and was already dressed and on her way to high school with her friends, Michelle and Sarah were getting ready for school, and Paul was getting ready for work. I was resting in bed, waiting for Rebecca – who had turned 2 months old the day before – to wake up for her morning bottle. Paul came into the bedroom and said he had just heard on the radio that a plane had hit the World Trade Center and it was on fire. Now, at the time, we had NO idea that this was anything other than a horrible, tragic accident. Why would we – or anyone who wasn’t right there when it happened, for that matter – have thought anything differently? We both thought that perhaps it was a small aircraft that had hit the building, and was more of a New York local interest story than anything else. The story was still so new that nobody really had any idea what, exactly, was going on. We decided to turn the TV on, to see what was happening. What we saw was worse than what we were expecting – it was obvious that a much larger aircraft had hit the building, and I remember thinking that something must have gone horribly wrong with the aircraft’s electronic systems. I also remember thinking that the fire was going to have to burn itself out, because there wasn’t going to be any way to fight such a large fire so high up. I remember thinking that I hoped that all of the people above the fire would be able to get out. It was hard to wrap my brain around the thought of the scale of the damage. By this time, Rebecca was up and was happily settled in my lap, drinking her bottle – again, a day like any other. We called Michelle and Sarah in to see what was going on – it’s not every day that you see a huge skyscraper on fire, after all. They were kind of intrigued, but at 9 and 10, it seemed as if they weren’t really thinking about what was going on in a city they had no connection to; they had friends to see at school and things to do that day. The plane disappeared from view behind the other building, but it didn’t reappear like it should have. As my brain was trying to process this thought, a huge fireball appeared where the plane SHOULD have been. I remember gasping in horror. I remember my eyes getting really big. I remember Diane Sawyer echoing what everyone watching must have been thinking – “Oh, my God.” I remember my heart dropping to my stomach. I remember looking at Paul, and saying, “That was NO accident.” I remember thinking that I had just witnessed the death of all of the people on that plane, as well as all of the people in the building who were in the path of the plane’s impact. And then I remember the overwhelming fear. It just washed over me as I sat there with the people that I loved more than life itself – the world had just changed, and suddenly they were in danger. I remember the tears welling up in my eyes, because in their innocence my children didn’t yet understand the meaning of what had just happened. I remember thinking that I was going to have to be very, very strong for them so that they would never know how scared their mother was for them and for the country. Because I remember thinking at that moment that there was a threat out there and we didn’t know what it was, where it was coming from, or what it was going to mean to our country. All I knew was that no matter what, I would fight to the death to keep my loved ones safe. I remember looking down into the face of my innocent baby and feeling much closer to my maternal grandmother at that moment. I remember thinking that 60 years earlier she had been the mother of a 3-year-old girl (my mother) and an infant daughter, and I wondered if she had felt that same fear for her children when she first heard about Pearl Harbor. I remember wondering if she had felt the same need to be strong for those she loved, and I wondered if she had felt the same fear for their futures that I was feeling at that moment. Paul took the girls to school and went to work. He didn’t really have a choice – Lockheed was immediately put on high alert, as not only was that the facility where F-16’s are assembled, but they also share a runway with the Naval Joint Reserve Base – and we both figured that the best thing for the girls was for life to continue as normally as possible for them. I knew that it wouldn’t be good for them to see their mom worrying at home – and they wanted the comforting continuity of being with their friends. I remember thinking that I was bound and determined that the animals who were responsible for this were not going to steal the innocent happiness and security of my childrens’ childhood from them. Not long after everyone had left the house, news cameras showed pictures of smoke where a third plane had hit the Pentagon, and cameras kept showing pictures of the White House. For the first time in my memory, all airspace over the United States was closed, and all flights were ordered to land at the nearest airport, no matter where their final destination might have been that day. Then came reports of a 4th plane still in the air that wasn’t responding to air traffic control. If there had been any remaining doubt in anyone’s mind, this confirmed that our country was under attack. And I remember wondering how many places had been targeted in our country that day. Before they left for school, I remember the girls asking if the buildings were going to fall down. Having studied just enough engineering in college, I knew how well buildings – especially skyscrapers – are designed, and that all sorts of contingencies and factors of safety are built into their design. I even remembered that during World War II a plane had hit the Empire State Building, and all skyscrapers since then had been designed with the very remote possibility of that happening again in mind. So I was pretty confident when I told them that while the buildings might not be usable again, they should remain standing. I remember calling my parents’ house; my mom wasn’t there, so I talked to my dad. He hadn’t turned on the TV yet that morning, so I started telling him what was going on. While relating what had happened – and still watching the news coverage of the aftermath of the unthinkable – I remember seeing a tiny flicker on the right side of one of the buildings. I remember watching in horror as yet another unthinkable thing happened. I remember screaming into the phone in disbelief as one of the towers fell down upon itself in a cloud of dust, and my father – who still hadn’t turned on his TV, and was trying to understand what I was telling him – asking me if this was a joke; and if so, it wasn’t very funny. I remember telling him that in my wildest imagination, I could NEVER have come up with something like what was happening in real time, and he needed to turn on his TV right then, because I had to get off of the phone. I couldn’t tell him that I was ready to lose it big time, and I didn’t want my Daddy to hear his little girl in that kind of a panic. I remember trying to call Paul at work, only to find that all of the phone lines were busy. So I tried his cell phone, but he didn’t answer. Then I tried his pager – again, no answer. I started thinking the worst; I didn’t realize at the time that he had accidentally left both of them at home that day. I heard that a friend’s husband had boarded a plane that morning on his way home from a business trip overseas . At the time, the news stations were still trying to figure out which planes were involved and where they originated – my friend was frantically trying to get information about his whereabouts, and all of the computers and phones were overloaded or blocked where she worked. I couldn’t do anything for the people on the East Coast, but I remember thinking that I could stay by the TV and computer at home, trying to get that information to her as soon as it became available. I remember leaving a message for her; I don’t know if she had already gotten the information, but it made me feel like I had done SOMETHING to help somebody that day. I remember thinking that another friend, who had tragically and unexpectedly lost her oldest son just a few months earlier in an car accident, understood better than most the magnitude of the grief that so many parents were experiencing that day. No matter what other personal relationships they may have had, every last one of the people who perished that day was somebody’s child. 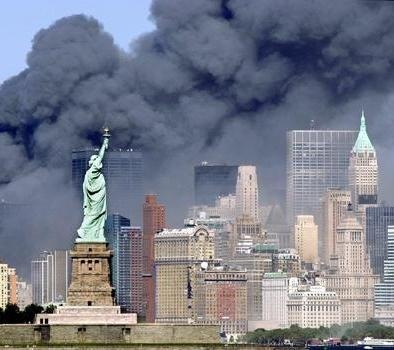 I remember thinking that an awful lot of people lost their children that day. I remember thinking about all of the husbands and wives who would be going to bed alone that night and every night after that. I remember thinking about all of the children whose mommies and daddies would never come home again. And I remember how very grateful I was that I still had all of my loved ones with me. The whole day was surreal – I remember feeling like everyone was walking around in a daze, because the shock and grief was so very overwhelming. I couldn’t even begin to imagine what it must have been like in places closer to New York, Washington D.C., and that lonely field in Pennsylvania. We went to church that night to mourn. We watched as our President addressed the nation. We lit candles for those whose lives were lost. We prayed for strength – for the families who had lost so much; for the people in the cities most impacted; for the people of our nation; and for a President who was suddenly tasked with the protection of the American people and the safety of the entire country at a time of dire national crisis. That day, the flags started coming out. Not having one of our own, Paul decided to buy one after work, but there wasn’t a flag to be had anywhere (and there wouldn’t be for many weeks to come). I began to understand how people must have felt in 1941 when they heard about Pearl Harbor, and I knew that whoever had done this might not realize it yet, but they had made a terrible, terrible mistake. For I finally understood what that line – “I fear all we have done is to awaken a sleeping giant and fill him with a terrible resolve” – really and truly meant. Americans were grieving that day, but we were not beaten – a reckoning would be forthcoming. This entry was posted in Annual Posts, I Love America, Think about it and tagged 9/11, Somber Anniversary. Bookmark the permalink. I was feeding my 3 month old son his bottle… The horror and shock. Stayed glued to the TV almost all day. Praying. Such profound sadness.